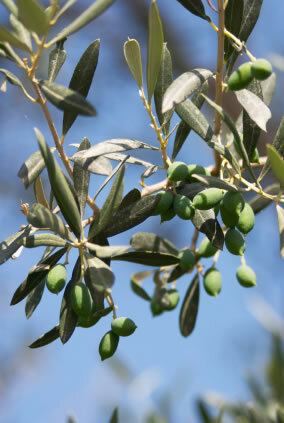 Oleuropein is the active ingredient or glucoside, found in green olives and olive leaf. Olive leaf is found on the olive tree. Another active ingredient found in olive leaf is hydroxytyrosol, polyphenols, flavonoids, and Oleocanthal. Oleuropein and olive oil, extracted from green olives and olive leaves, are known in alternative medicine for its medicinal benefits. Scientists began to evaluate the benefits of oleuropein, olive leaf, and olive oil. These studies began when scientists noticed that individuals in the Mediterranean consistently showed a lower occurrence of heart disease and cancers. The cancers with the lowest incidence were prostate and colon cancers. Scientists attributed this finding to the diet consisting of mostly fruits, vegetables, peas and fish. 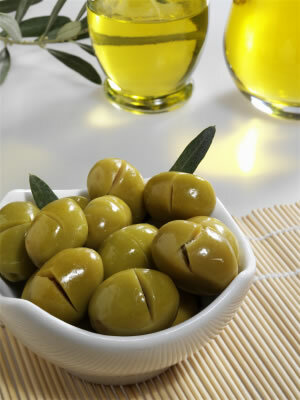 But more importantly, it is attributed to olive oil comprising the majority of the fat content within the diet. Oleuropein or olive oil is known for its anti-aging effects, its antifungal properties, its anti-infllamatory properties, its antibiotic properties and its immunostimulators. Olive leaf extracts have also been known to lower blood pressure. Scientists discovered, in an international study, that olive leaf extract contained twice the antioxidants of green tea extract and 400 percent higher than Vitamin C.
Natural pathogens killer: It kills pathogens by preventing pathogens from replicating. Because of its remarkable antioxidant properties, oleuropein protects the body from free radicals. When free radicals undergo the oxidation process, they may cause cellular damage if they exist in the body in excess for extended periods of time. Free radicals are highly reactive. Therefore, antioxidants must be introduced to prevent development of diseases such as cancer and other diseases. Oleuropein is a polyphenol extracted from the leaves, bark, root, and fruit of the olive tree. The olive tree contains agents that make it highly resistant to insect damage and other diseases. Oleuropein is also classified as an iridoid. This plant substance is present in olive oil and in the olive tree. Another agent contained in oleuropein is elenolic acid. This particular acid is particularly useful in maintaining the body’s immune system. This portion of oleuropein, elenoic acid, balances bacteria, while promoting a healthy immune system. The olive leaf extract has been used for thousands of years. The Egyptians and the Mediterranean cultures have long used this particular extract to alleviate a number of health conditions. Thousands of years ago, the Egyptians recognized the olive leaf as a symbol of heavenly power. The Egyptians used the extracted oil to mummify their Egyptian kings. Olive leaf was also used in the 1880s to alleviate symptoms associated with malaria. Biblical references were also made to the olive tree as “The Tree of Life.” Scientists believed the ancient people referred to the olive tree as “The Tree of Life” because of its medicinal properties. Even ancient people recognized the efficacy of the supplement. Olive leaf extracts or oleuropein may also be found in topical creams. Oleuropein is often found in soaps and moisturizers. The active agent, oleuropein, helps to repair the skin. Some experts believe that 50 grams of olive oil per day is thought to have an equivalent effect to 0.1 of the adult ibuprofen dosage and use. Many physicians suggest that the polyphenols in red wine have an antioxidant effect. Similarly, the polyphenols in oleuropein have an antioxidant effect in reducing the oxidation of bad or LDL cholesterol. Olive oil contains more antioxidants than a glass of red wine. However, most enjoy wine over olive oil. Olive oil contains at least 4 different antioxidants. These antioxidants assist in eliminating free radicals in the body. Free radicals assist in skin aging. Olive oil helps to fight skin cancer and aging. Ozonated olive oil is also supposed to soothe the skin as well. Some experts recommend boiling ozonated olive oil until it forms into a paste. Rub the paste onto the skin for soothing and healing promotion. Olive oil contains a significant amount of a natural emollient called squalene. Squalene is able to moisturize the skin without leaving a film behind. Olive oil is also rich in vitamins A and E. Both of these vitamins contain healing properties for the skin. Polyphenols are also present. Each of these vitamins is prevalent in many beauty products. Some alternative medicine providers recommend olive oil as a natural remedy for earaches. Sufferers are advised to apply the olive oil to a cotton swab and gently massage the out portion of the ear cavity. This is supposed to alleviate some of the associated pain and loosen the earwax. Some individuals suggest heating the oil for added benefit. Olive oil provides relief from damaged hair. Simply apply the oil to the hair, while the hair is wet. Allow the oil to remain on the hair for 30 minutes. Rinse the oil from the hair. Enjoy the lustrous look and feel of the hair. Individuals suffering from sunburn should to mix olive oil with white vinegar. Pour the mixture into a warm bath. The healing agents in olive oil sooth the skin and alleviate the burning sensation. To alleviate symptoms associated with dandruff, mix olive oil with almond oil. Leave the product on the scalp for five minutes. Rinse the mixture from the hair to remove the dandruff. If the oil burns the scalp, rinse it immediately. Individuals who have sensitive skin may want to use olive oil as a shaving lubricant. The oils natural healing agents will soothe the skin. Olive oil or oleuropein help to ward off fungi and yeast accumulation. Both of these may contribute to fatigue and lethargy. Individuals who consume oil on a daily basis have more energy to function. Consumers may choose to select the form based upon the type that is easiest for them to consume. Alternatively, the form may be selected based upon the amount of time it takes for the drug to be consumed into the blood stream. Olive leaf contains oleuropein. One of the active ingredients in oleuropein is polyphenol. Polyphenols are helpful in finding free radicals and eliminating them to prevent disease. Several studies demonstrate the efficacy of olive leaf in the prevention of LDL cholesterol. The extract works by inhibiting LDL oxidation. High LDL levels are linked to the formation of atherosclerotic plaques. These plaques contribute to the formation of coronary heart disease. Active ingredients in the olive leaf have also prevented metal ion chelation and perioxidative chain reactions. These two processes have been cited by scientists as playing a role in the development of heart disease and cancer. Olive leaf may also be beneficial in inhibiting enzymes that contribute to the inflammatory process, as well as, platelet aggregation, and inhibition of procarcinogen activation. Though people who consume olive oil on a regular basis benefit from its health ramifications, there is no conclusive data indicating each of the benefits of oleuropein. Studies are being conducted with rodent subjects to determine the results conclusively. Each of the components of olive leaf, oleuropein, tyrosol, polyphenols and others must be studied separately in order to determine the efficacy of each component. Since no research has been conducted to establish the necessity of oleuropein in a person’s daily diet, the Food and Drug Administration does not establish a Recommended Daily Allowance (RDA) with this particular supplement. More studies must be conducted to prove the efficacy of the supplement in an individual’s daily diet. Individuals who desire to begin a regimen including olive leaf or oleuropein should follow the instruction of a physician or the label on the bottle. In general, however, individuals are recommended to take between 1 and 3 capsules with meals daily. Alternatively, if the person is ill, they should consume 1 capsule every 4 and 6 hours. The product typically remains fresh and consumable for 2 years. Most forms originate from the Olea Europaea Olive Leaf Tree and stem. The leaves are gathered annually. The oil is extracted through a hydroenthanolic process. The capsule form of oleuropein contains no yeast, corn, wheat, gluten, soy, milk, preservatives or colors. This particular supplement is widely used within the Mediterranean diet and has been proven safe for consumption. There are no known regions that restrict the use of this particular supplement in the diet. Therefore, it is safe to consume oleuropein in any region of the country. Individuals with low blood pressure and diabetes may suffer even lower blood pressure and blood glucose levels as a result of consumption of oleuropein. Oleuropein may also interact with other pharmaceutical drugs that are designed to lower blood pressure or regulate diabetes. The interaction could result in a dangerous situation. Those who experience symptoms such as headache, nausea, flu-like symptoms, fainting, dizziness, and other life threatening symptoms should consult a physician immediately. Those who are pregnant should conduct their physician before use. Keep the physician informed of each medication that you are taking in order to avoid unpleasant interactions or side effects. Oleuropein may be purchased in any health food store or online. The amounts and forms that oleuropein will vary from store to store, depending upon the availability. The dosage ranges from 150 milligrams to 700 milligrams of olive leaf or oleuropein. The number of capsules or tablets per bottle range from 30 to 120. The prices of these forms of oleuropein vary based upon the potency, the brand, the amount per bottle, the type, and the store. For example, a consumer may purchase a bottle of 150 mg capsules of olive leaf for approximately $10. The bottle may contain 60 caplets. Alternatively, a consumer may purchase a bottle of 500 mg capsules of olive leaf for a little over $60. The costs vary significantly based upon the aforementioned attributes. Consumers are advised to shop around and conduct research to determine the best price for this particular supplement. My name is Kim Wang and this site is my work in progress helping to pass on some of the things my mother has taught me over the years. I hope you find it helpful! I found at the above website with multiple approaches to finding cheap Olive Leaf products. It has helped me enourmously with “skin tags” a common skin ailment around the neck and under arms. I really enjoyed reading more about Olive Leaf and its benefits on your site. Does it have ane effect on digestion? Like can it cause loose motion? I HAVE POLYCYSTIC LIVER DISEASE. CAN OLIVE LEAF EXTRACT HELP THIS CONDITION, OR CAN IT BE HARMFUL? I have been researching olive leaf extract, and have run into a few problems. On a couple sites it says that olive leaf side effects are just your body ridding itself of toxins (headache, nausea, body aches, etc). But on other sites, it says that if you feel these side effects, to immediately stop taking olive leaf extract and see your doctor. Which one is it!!! I want my family and myself to live healthier and try natural remedies, but I cannot ever get a straight answer on safety! As we are producing olive oil and have been using olive oil in almost everything, I can assure you that olive oil and everything related to it is very very safe. You do not have to worry. You cannot eat one teaspoon of salt in a salad plate, so you cannot drink a glass of oil like water. Moral: balance the intake of anything. Regards and sorry for my English if not perfect. I have been taking it for years and the only time I had side effects was the first 2 weeks then never again. It was getting rid of the toxins in my body. This sounds really good to me. I plan on getting some right away. I love taking herbs to heal my body. Have been for years… When I get a “cold” U prefer Olive leaf to Echinacea.. Echinacea, is only a combat to bacteria,, but Olive Leaf is better to me because it helps with a virus as well. Great when you aren’t sure whether or not your cold is bacterial infection or viral infection.. While I was taking oleuropein capsules I felt nausea every day for several minutes or even hours, even vomitting twice which normally does not happen to me. I had detoxified may times before and never felt any side effects so this probably disagrees somehow with my body – not sure who can explain that. I advise to use olive oil instead of taking capsules. leave the substance to be used for dermatology issues. live healthy as much as you can. eat healthy and fresh. I’ve been taking olive tree extract for 2 weeks now because I was looking for a natural cure for toe nail fungus. Happy to report no serious side effects. The only one is I started getting small itchy red bumps on my arms that look like a rash; nothing alarming though. I’ve been trying to figure out a way to get rid of hsv2 for good….. & I came across an article naming this product as they answer for that. I’ve been taking the capsules since Monday, bur does this really work for the virus? Does it kill the virus completely? Like, will I EVER have to worry about another outbreak? How long does it take to get rid of the virus? Do I have to swallow the pill whole or can I dump the powder in water & drink it like that? How many pills should I take a day? Sorry for all the questions, but I need answers….. I’m tired of having to have secrets! I have been researching this product and came across the answers you’re looking for. You’re to take one capsule three times a day, best at mealtime. The article also states if you are feeling under the weather you should take one capsule every 4-6 hours. High blood pressure, the Herpesviruses (both 1-2). It also makes a statement that if used for that type of infection listed above that you can get the powder form and make a mix to put directly onto your area where needed. Just please make sure you do a drug interaction search to avoid any serious side affects. I agree with Toni Bou Issa. I new someone who had hsv2 and she was devastated. I talked to her about it and did some research and found olive leaf, I told her to take 1500mg a day (500mg at 8am 500mg at 2pm and 500mg at 8pm). She did this for 3 months and after the 3 months she was all clear. The product she used is was not cheap since a bottle will last 2 weeks but at least you can be free from it, good luck. Forgot to mention, NO alcohol and no more than the recommended daily sugar amount since they both highly impact your immune system. Also be on a healthy diet. Please advise. I just started taking the olive leaf pills as directed. I have been battling severe sinus infection for 3 months. Tired of not being able to breathe, conjestion never stopping with anti-histamines, decongestants, and Vitamin C round the clock. No immunity left. I am feeling better with O.L. but still sick. How long does it take. I don’t want antibiotics from doctor. I have read somewhere that Oleuropein contents in the olive leaf extracts dont have any side effects. But some people could experience herxheimers reaction, usually lasts for around 5-7 days, if they have a high viral load or a lot of pathogens in their body. Like feeling queasy and even cause mild diarrhea, which is simply a “die-off” reaction. Because OLE is such a powerful detoxifier.